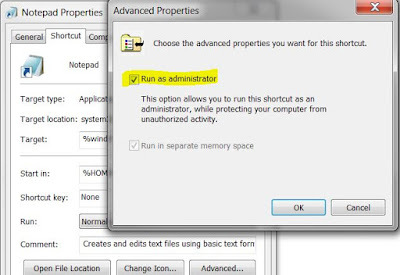 I have Windows 7 machine and have set myself as the Administrator. However, when trying to modify an XML file in Notepad and save the file, it states 'Access Denied!'. It will not save the file. Step 1. Open the notepad application in elevated mode. 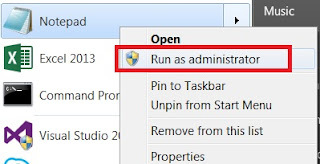 This can be done by right click the Notepad icon from Windows > Click 'Run as administrator'. Step 2. You can now edit and save that file in the same folder without any issues. If you want to open the notepad elevated every time, then right click the Notepad shortcut icon > in 'shortcut' tab click on the 'Advanced' button > tick 'run as administrator'.